STEM Story Time 10:15-10:45 a.m. OR 11:15-11:45 a.m. 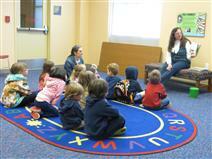 STEM Story Time is a regular Story Time with Science, Technology, Engineering, and Math elements added in! In addition to the regular stories, action rhymes and/or songs of regular Story Time, children and their caregivers can also stay for a STEM activity. Story times provide a foundation for building a lifelong love of books and reading. Please call the Children’s Department at 817-427-6818 for more information.